Volkswagen had two big unveils at this year’s New York International Auto Show starting with the Atlas Tanoak, a new pickup truck based on the Atlas Cross concept which features a lot of rugged features truck buyers usually are looking for. Is this the next Volkswagen Amarok and are we going to get it in Canada? Here’s hoping. The Tanoak unveiled in New York may just be a concept, the fact remains that it doesn’t seem too far off being production-ready. It’s powered by a 3.6-liter V6 engine that delivers 276 horsepower and 266 pound-feet of torque which is sent to all four wheels through an 8-speed automatic. The Atlas Tanoak Concept’s wheelbase is 28 centimeters longer than what we find on the current Atlas, and the model showcased in New York has 20 inch wheels with rather beefy tires. In the back, the Atlas Tanoak has a modular tailgate which makes it easy to transport long objects like a ladder or wood. The interior of the Atlas Tanoak is basically a more modern version of the current Atlas’ interior which has many speculating that we will soon see a VW pickup in Canada. 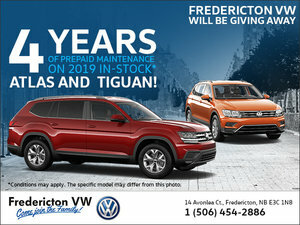 To learn more, contact us today at Fredericton VW!